Ideal for the prevention of acid / caustic / EI15 oil and diesel. The PTFE-Clear screen is made of Teflon-coated glass fiber, with wide central tape of clear Teflon (ECTFE). This enables visual inspection of the expansion joint. 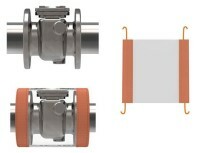 Seam is Teflon-coated glass thread.